Advanced Dermatology Care was started in 1993 by Dr. O.J. and Dr. Ruth Rustad, with the goal of providing the highest quality care in all three aspects of dermatology: medical, surgical, and cosmetic. ADCâ€™s commitment to dermatology excellence is exhibited in continually striving to provide the most advanced and highest quality care. 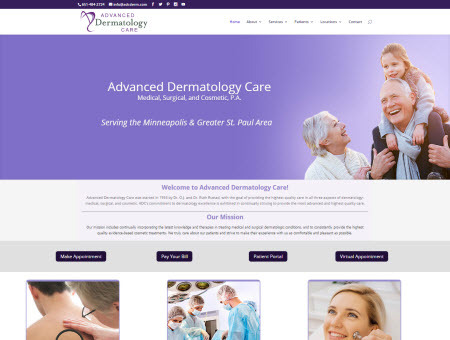 In conjunction with ADC, Advanced Esthetics (the cosmetic division of the practice) offers consults & treatments for your skin care needs in cosmetic dermatology in St. Paul, MN and surrounding areas. There mission includes continually incorporating the latest knowledge and therapies in treating medical and surgical dermatological conditions, and to consistently provide the highest quality evidence-based cosmetic treatments. BAMsites was retained to redo a website created by DEX. With our history in healthcare marketing, we constructed a site with two main purposes. First, we wanted it to be simple, clean and easy to navigate by a wide range of demographics. Second we wanted to organize the information to make it super user friendly for folks to find what they want quickly. 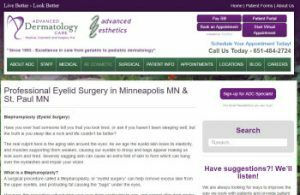 We also invested a lot of time in SEO to help the site show up for dermatology and skin related search terms in the St. Paul and suburbs region. Since dermatology services apply to people of all ages, we displayed young and old people on the main imagery. We also didn’t want the obligatory slideshow on the top of the home page, which can be irritating in some case. Having a static image helps folks quickly move onto other aspects of the site without distraction. We have been involved in healthcare marketing for over 25 years and feel our experience can really help this practice pull in targeted patients and aid in the continuing success of this great medical practice.